Barnt Green author Steve Dunn’s fifth book on WWI naval exploits is another incredibly detailed account of a crucial but largely forgotten battle, fought in difficult conditions by what was “essentially an amateurs’ navy”. It tells of the Dover Patrol, which prevented German access to and from the Atlantic throughout the conflict, thereby keeping British supply lines open and securing the Channel against invasion. Astonishingly, this task was achieved despite a huge lack of resources and men, with a “kaleidoscopic array” of civilian ships pressed into service and manned mainly by reservists and volunteers. Part of the tale focuses on the three Admirals who took charge of the Dover Patrol. We learn how all three were affected by the internecine politics, intrigues and cliques of the Admiralty (the top brass were so busy fighting each other it’s a wonder they had time for the actual war), and Dunn’s readers will not be surprised to learn that Winston Churchill pops up to stir the pot. The book contains a lot of military strategy and technical detail, but is saved from being dry by the author’s skilful humanisation of events, making use of first-person accounts and weaving in anecdotes, such as the diminutive cabin boy shoved through a window by his larger shipmates to become their vessel’s sole survivor. The complexities of the infamous Zeebrugge and Ostend Raids are examined in particular detail. It’s interesting to note that the Navy propaganda machine saw “complete failure heralded as victory”– and that there was even a row over how many medals were awarded. Another section concentrates on the dangers of minesweeping, and there are vivid descriptions of ships sunk by mines as well as shells. There are even appendices listing all ships involved in the Patrol, all U-boats sunk by it, and all VCs awarded to its men. 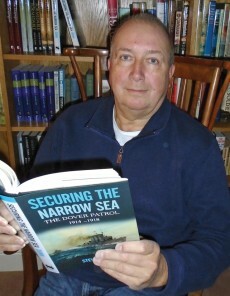 Securing the Narrow Sea is available from Amazon, Seaforth Publishing or good bookshops.